BOSTON—Spanning five days, this conference brings together the world’s most prolific and fascinating designers, freelancers, and other creative professionals, who share their insights on the issues that affect creative pros—from tech trends to career advice to creative inspiration—and distill the most important lessons they’ve learned in their careers into concrete advice and inspiration you’ll put to use your first day back at the office. SAN FRANCISCO—Join Rise of the DEO authors Maria Giudice and Christopher Ireland for a book signing event at Carbon Five. Meet us for Happy (Half) Hour at 6:30, then turn your attention to David Hendee, Director of Design at Carbon Five, who will be interviewing the authors and taking questions from the audience. Book signing to follow. Buy a copy in advance and bring it with you, or purchase one at the event. Register today! Hope to see you there. SAN FRANCISCO—Part inspiration, part mentorship, SheSays is a global creative network for women, with past speakers from IDEO, Google Labs, Cooper Hewitt Design Museum in NY, and a variety of the most creative agencies around. The goal of SheSays is to get more women into creative leadership positions. 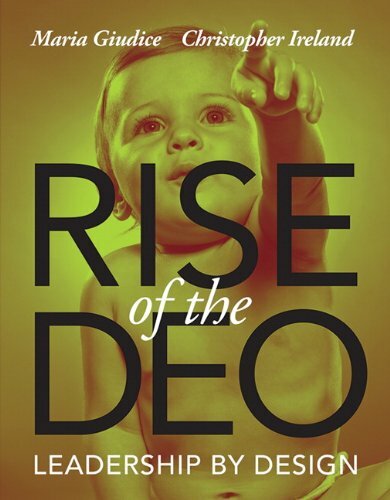 In this Webinar, Facebook Director of Product Design Maria Giudice and startup mentor Christopher Ireland examine topics from their stunning new book, Rise of the DEO: Leadership by Design. They’ll take attendees on a deep dive into the intersection of creativity and business acumen, explaining how and why this unlikely coupling produces leaders most capable of solving our increasingly complex problems. Attendees will learn not only why this form of leadership is essential to the success of modern organizations, but also what characteristics are best suited to this role. CHICAGO—Cusp is a conference about the design of everything. What happens at Cusp doesn't really happen at Cusp. It happens later, in a brainstorming or ideation session, during an innovation exercise, or in a quiet moment when an idea forms. What happens at Cusp happens in the minds of the people who take it all in and take it home with them.